On Dec. 14, 2014, the Cleveland Browns’ Andrew Hawkins wore a T-shirt during warm-ups and pregame introductions to protest the deaths of Tamir Rice and John Crawford. 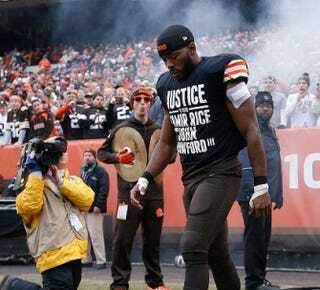 Cleveland police union President Jeff Follmer has blasted the Cleveland Browns’ wide receiver Andrew Hawkins for wearing a “Justice for Tamir Rice and John Crawford III” shirt, which Follmer referred to as “pathetic,” the Cleveland Plain Dealer reports. Hawkins has joined the growing list of athletes—professional and collegiate—wearing shirts during pregame warm-ups protesting various police shootings. The back of Hawkins’ shirt, which he wore during a Sunday home game against the Cincinnati Bengals at First Energy Stadium, read, “The Real Battle for Ohio,” according to the Plain Dealer. His actions have drawn the attention of Follmer, who is demanding an apology from the Browns for the “disrespectful” act. “He’s an athlete. He’s someone with no facts of the case whatsoever,” Follmer said, according to the Plain Dealer. “He’s disrespecting the police on a job that we had to do and make a split-second decision. Tamir, 12, a native of Cleveland, was playing in a park near his home with an airsoft BB gun when he was shot by rookie cop Timothy Loehmann within seconds of the police officer arriving on the scene in late August. Crawford, who was at a Wal-Mart in Beavercreek, Ohio, was shot by police in August while holding a BB gun, which was being sold in the store, as he shopped. Read more at the Cleveland Plain Dealer.